If you suffer from excessive perspiration, the chances are you always feel self conscious and embarrassed, which can have a huge effect on your quality of life and confidence levels. This is where using a product such as Anhydrol Forte Roll On 20% w/v Cutaneous Solution can really help. 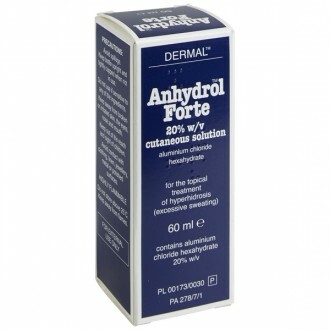 Anhydrol Forte Roll On 20% W/V Cutaneous Solution is designed for use by those who experience excessive sweating that affects the hands, feet, or armpits. The clear, colourless liquid can be applied as necessary at night and then washed off in the morning. Containing aluminium chloride hexahydrate, this medication is an antiperspirant which stops you sweating. When you apply this medication to your skin, the aluminium chloride blocks the sweat glands. The fluid pressure within the sweat glands then rises, causing the temporary cessation of the production of sweat. Use Anhydrol Forte before going to bed, as this will block the sweat glands when they are least active. Even though you must wash off the medication in the morning, there will be no sweat produced during the day, as the glands will remain blocked. Unblocking occurs naturally when our skin is shed during the day. The treatment can be used by adults, children over 12 and seniors and is generally used for two nights in a row followed by two nights without treatment. Wearing light clothes, changing clothes and footwear regularly and not re-using sweaty or damp clothes are ways you can stay sweat-free for longer. An anti-fungal dusting powder like Daktarin Activ, Daktarin powder or Mycota powder can help to absorb excessive moisture especially if you need treatment on your feet. Make sure the area your treating is dry and apply Anhydrol Forte last thing at night (because your sweat glands are less active at night). Wash off all treated areas thoroughly with water in the morning. he first 2 applications should be done on consecutive days followed by two days without an application. This cycle can be repeated and adjusted for your own needs. Should you experience redness or other side effects then you may need to decrease frequency of application. Some transient irritation and redness normally only where Anhydrol Forte has been applied. Make sure that areas of skin to be treated are completely dry. Do not bathe or shower immediately before applying Anhydrol Forte. Do not shave the armpits or use a hair-removing preparation within 12 hours before or after using Anhydrol Forte. Do not attempt to remove the roller-ball head, as this may cause spillage of the contents which may damage eyes or irritate skin. Do not get Anhydrol Forte on your clothes, linen, fabric, jewellery, metal or polished surfaces as it may damage them. Wash hands immediately and thoroughly after use (unless treating them), and after any inadvertent contact with Anhydrol Forte. If Anhydrol Forte is accidentally swallowed, or gets into the eyes, contact a doctor or hospital straight away. Anhydrol Forte is for external use only.